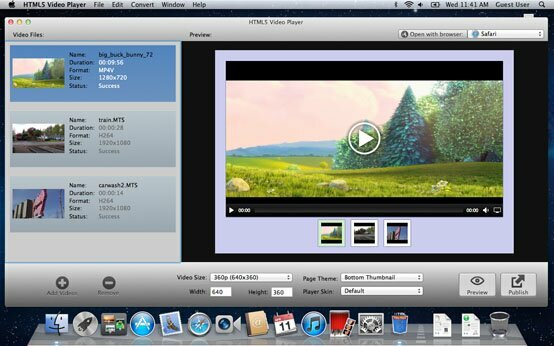 The HTML5 music video player allows you to drag and drop video clips to rearrange your music video order or playlist. Also your website users will have the option/navigation to skip or repeat certain music video playback. Both Windows and Mac versions are ready to download, download HTML5 Music Video Player here. Almost all modern browsers should support the player for HTML5, such as Internet Explorer 9, Firefox, Opera, Chrome, Safari, etc. For those old browsers, such as Internet Explorer 8 and earlier versions of other browser that do not support the html5 < video > element, the output music videos and players are still playable on them, it is because this HTML5 music video player has the Flash fallback function. When the old browser can't recognize the HTML5 video or element, the flash version of your music video will be loaded and played automatically. Other than much better browser support, your HTML5 enhanced video is compatible with more hardware devices as well. By converting your music video to HTML5 formats, you will get the compatible HTML5 music video for iOS devices like iPhone, iPad, Android devices like HTC, Samsung, Windows phone devices and many more mobile and tablet devices. See the HTML5 video support and FAQs here. How to Make HTML5 Music Video? This HTML5 music video formats converter made the encoding of HTML5 music video formats very easy. You can simply following bellow 3 easy steps to get it done quickly. 3. Click ‘Publish’ to generate HTML5 music video with elegant player for your websites.